It’s a problem when you have one device running low on batteries, but it’s even more difficult when you have two or three all in need of a little juice. I’ve run into this on road trips with my family. We’ve each got a gadget but the car only has two outlets so that means a spiderweb of wires and splitters. It also means we’re all searching for outlets at hotel stops and then trying not to leave anything behind the next day. The myCharge Portable Power Bank 6000 is an easy solution to this problem. This 6000mAh battery pack not only gives you the ability to quickly and easily charge devices on the go, it can charge a wide variety of device including smartphones, ereaders, bluetooth headsets and even ipads simultaneously. It comes with a USB port and built-in Apple, micro USB, and mini USB connectors that are attached to the battery so you just snap them open to use and then snap them back in place when you’re done. You don’t have to walk around with a pocket full of wires and adaptors, and you don’t have to worry about losing one. This battery is no slouch in the power department either. 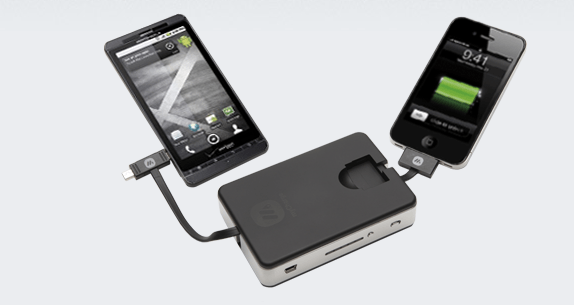 Depending on the exact device and how you use it your results will vary, but according to the manufacturer you can expect the following from the myCharge Portable Power Bank 6000. The unit itself is small enough that you could easily put it in a backpack or even a coat pocket and lightweight enough that it won’t weigh you down. Once you plug in your device you simply turn on the battery and it starts charging. There’s also a series of LED lights that you can activate with a button press so you can keep track of how much power you’ve got left in the battery. A USB to micro USB charging cord is included for charging the battery pack. Plug it directly into a computer or into the wall adapter that comes with smartphones and tablets and that’s it. You can even plug your iPhone into the battery while it’s charging from your computer and sync your phone at the same time. The myCharge Portable Power Bank 6000 retails for $99.99 and is well worth the price, particularly for those who travel frequently. If you’re simply looking for a smaller battery or one that’s tailored for a specific device, then head over to myCharge and see their full line of batteries. I was provided with this product for review purposes.